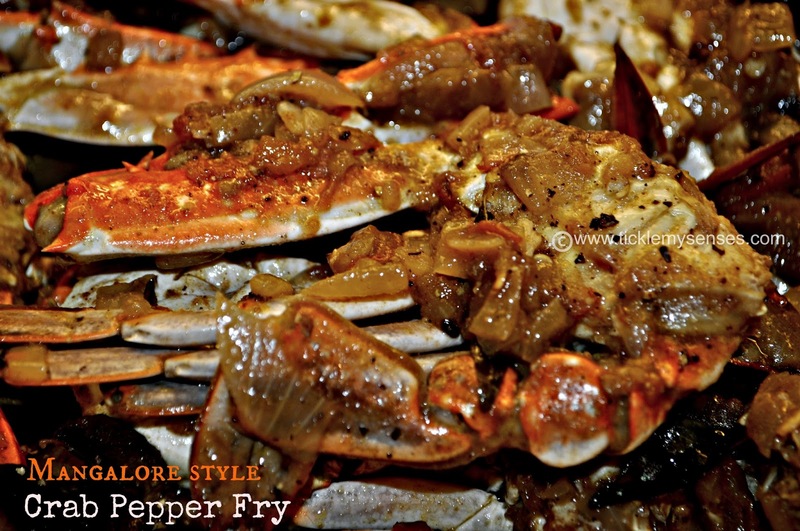 Tickle My Senses: Mangalore Style Crab Pepper Fry. This fish loving madness is not limited to the seasons, come rain or sun, it goes on and on through the year. Even if there were no fresh fish to buy, you would still find fish lovingly dished up at a Mangi's table. It could be a 'Dried fish chutney' or a 'pickled prawn or fish made by grandma or 'Mai' or 'Dried shrimps in a vegetable side dish' or a 'Simple fish curry' made from a stash thats been strategically hidden away in a Mangi's freezer chest. Whether its a Mangi's 'true love for fish' or an 'unsatiable obsession' I dont know? 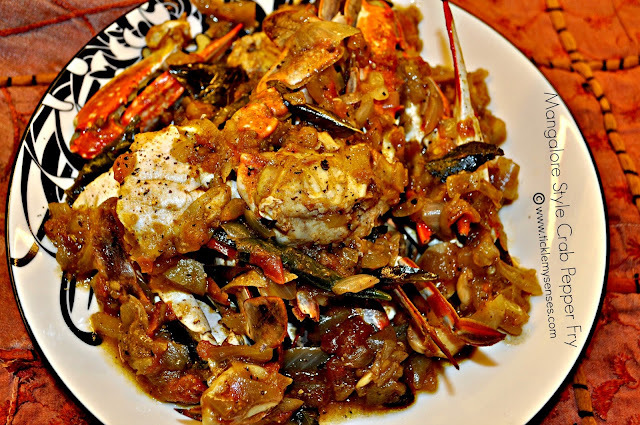 Crabs are either cooked in a rich deliciously Spicy Coconut Crab curry, as a hot Spicy Roast or simmered in a Pepper based dry dish like todays recipe. This dish is one of hubby's favourite and I learned to make it by watching my Mother in law. It is peppery, delicious and truly crabworthy! Serves: 2-3 | Preparation time: 40 minutes | Cooking time: 30 minutes. 1. Gently dry roast on a pan ( seperately) the peppercorns, fennel seeds, grated coconut, cinnamon, cumin seeds, methi seeds till aromatic and then grind to a fine paste using a very little water. 2. 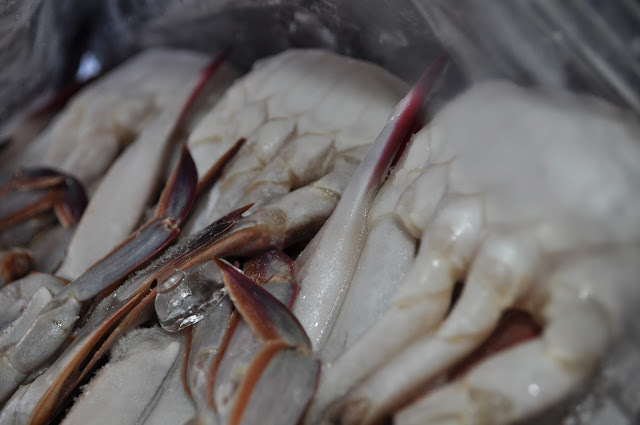 Clean crabs, and cut each crab into quarters and crack the legs gently, so the flavours can enter. 3. Heat oil in a large round bottomed vessel/ kadai. Add curry leaves followed by 1 cubed onion and slit green chillies and fry for 3-5 minutes on a medium flame. When the onions have softened add ginger-garlic paste and fry for 3-4 minutes till it turns golden brown. Then add the chopped tomatoes and salt. Fry for 3-4 minutes then add the coriander, chilli, turmeric and garam masala powders and continue to fry till the tomato gets mashed and the oil starts to separate. Add the remaining cubed onion and fry for a minute. Add the roasted ground paste, tamarind paste and mix well. 4. 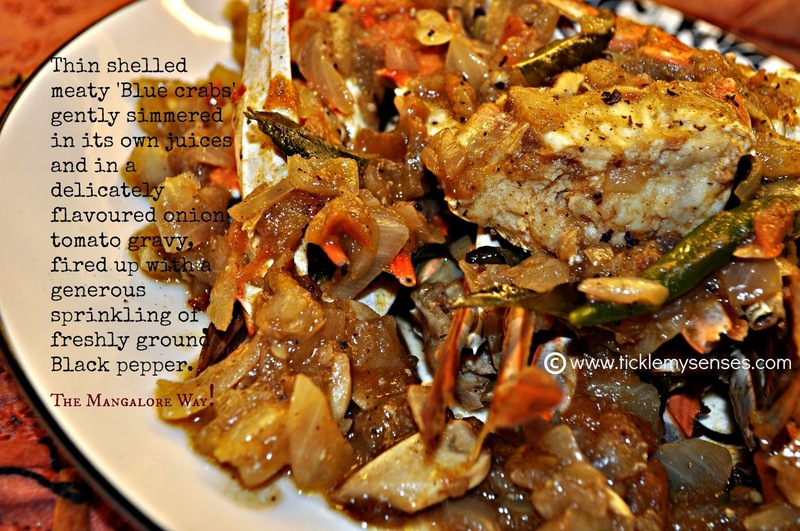 Add the cleaned crab toss well with the spicy onion tomato mixture. Add 2-3 tbps water only if required. Cover and cook on a medium flame for 5-7 minutes or till done. Taste for salt and sourness. Serve hot alongside some white rice and Daaliso saar or Mangalore lentil soup or enjoy on its own alongside a large Kingfisher ! If you liked this or any of my posts, I would love to hear from you. Leave me a line at the end of this post or message me on Facebook or carol@ticklemysenses.com. Look forward to hearing from you. looks sooo mouthwatering n tempting..